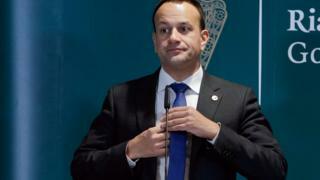 The Taoiseach (Irish prime minister) has said Brexit could be delayed for another year if British MPs decide they want the government to radically change its policy. He said MPs could back the current deal or choose to leave without a deal. Alternatively, they could choose a much closer future relationship with the EU than is currently proposed. Last night, Prime Minister Theresa May was granted an extra two weeks to come up with a Brexit solution after talks with EU leaders. The UK's departure date had originally been set for 29 March. If the prime minister cannot get the deal through, the UK will have to propose a way forward by 12 April for EU leaders to consider. DUP deputy leader Nigel Dodds MP said the prime minister had missed an opportunity to put forward proposals to facilitate an acceptable withdrawal agreement. "The government has consistently settled for inferior compromises when they didn't need to and when there was, and is, more negotiating with the EU to be done," he said. "The prime minister has now agreed with the EU to kick the can down the road for another two weeks and humiliatingly revoke her oft-stated pledge that the UK would leave the EU on 29 March. "Nothing has changed as far as the Withdrawal Agreement is concerned. Nothing fundamentally turns on the formal ratification of documents which the Attorney General has already said do not change the risk of the U.K. being trapped in the backstop." 29 March: Current Brexit date in UK law. 12 April: If MPs do not approve the withdrawal deal next week, "all options will remain open" until this date. The UK must propose a way forward before this date for consideration by EU leaders. 22 May: If MPs do approve the deal next week, Brexit will be delayed until this date. 23-26 May: European Parliamentary elections are held across member states. Mr Varadkar said alternative ways forward for the UK could include staying in a customs union with the EU after Brexit. He also pointed to the experience of the 'EEA countries' like Norway which are in the single market but not the EU. Mr Varadkar said the experience of the EEA countries shows there are "potential solutions" if the UK government and Parliament "choose to avail of them".